With SO much interest in my old-fashioned, no pectin added, gourmet preserves, we’re ‘putting-up’ jars in limited quantities to sell on a first-come first-served basis. 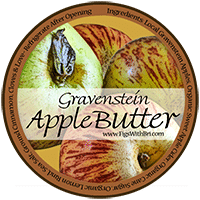 Our artisan-crafted organic Apple butter ~ a thick smooth creamy applesauce ~ is incredibly versatile: nice on scones, muffins, and toast; swirled into yogurt, a fruit topping for desserts and ice cream, or added to a smoothie. It makes healthy baby food, too! Our apple butter varies from batch to batch depending on what’s in season and whether we use a single variety or a mix. 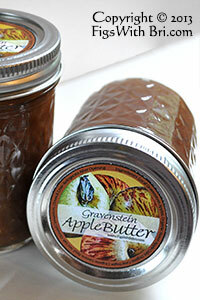 Apple Butter ~ Back in Stock! Introducing a new flavor: “Spiced Apple Butter with Rum.” Making more soon with the 2016 apple crop. INGREDIENTS: Organic or No-spray Local Apples, Organic Unsweetened Apple Cider or Juice, Orange Honey, Organic Lemon Juice, Organic Ground Spices: Cinnamon, Nutmeg, Allspice, Cloves, Ginger, a touch of Sea Salt & Love.